The new, decorative DL 30 LED town and park luminaire from Osram radiantly illuminates towns and cities. 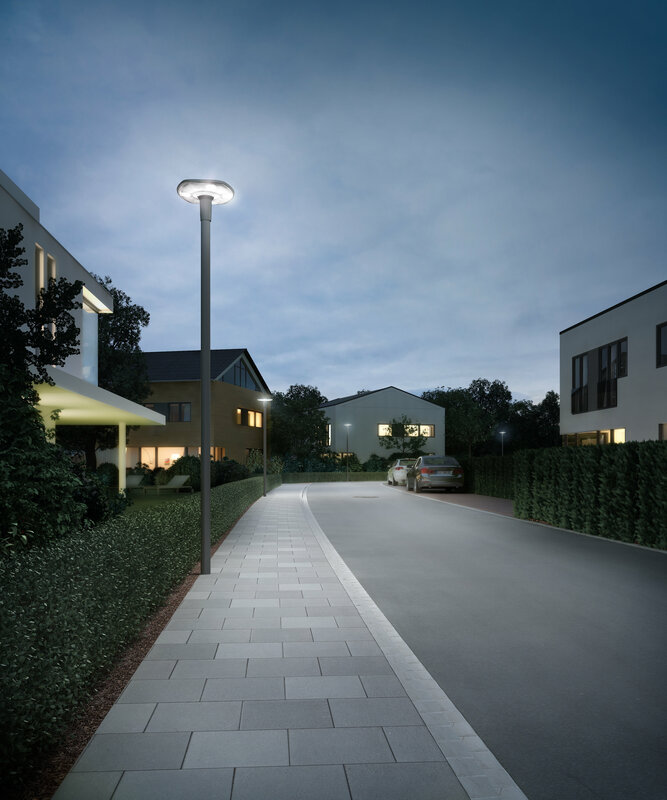 Whether for squares, crossings, parks or residential areas, the new LED generation for illuminating urban areas meets the essential requirements of municipal authorities and architects: innovative functions in combination with a high quality design, providing modern, inspiring options for designing urban environments. With diverse light distribution variants the new DL 30 LED is precisely the right solution for many different inner-city applications. A special feature is the new, asymmetric wide light distribution specifically for crossing zones. If the luminaire is mounted directly in the apex of the crossing it emits light literally 'around the corner' onto both streets thanks to its innovative light distribution. The design of the DL 30 LED has modern, purist lines, enabling it to blend discreetly into its architectural context. In darkness the integrative luminaire functions as an unobtrusive visual guiding element. The luminaire head and therefore the light emission surface is slightly illuminated, meaning that the DL 30 LED as optical guidance is clearly seen along the street, contributing essentially to greater orientation and safety in urban contexts. The intelligent control electronics of the DL 30 LED ensure that lighting intensity adapts to external conditions to enable especially efficient illumination. Osram has enhanced the previous luminous flux tracking function to now offer a new generation of constant luminous flux in the form of the patented CLO 2.0 version. This features new calculation parameters to contribute directly to the reliability and lifespan of the urban lighting. The innovative solution takes into account current and previous environmental factors such as wind and temperature, enabling more precise luminous flux tracking based on these factors of influence. The preset luminous flux level is reliably achieved at all times – independent of weather conditions. This maximises the energy efficiency of the lighting, cuts corresponding consumption costs and increases the service life. "The DL 30 LED features an ideal symbiosis between performance capability and high quality design and a convincing price-performance ratio," explained Anett Wagner, Product Manager at Osram Lighting Solutions. The new, decorative DL 30 LED town and park luminaire provides highly diverse design possibilities for urban environments. Whether for squares, crossings, parks or residential areas, the new DL 30 LED convinces with innovative functions in combination with a high quality design. OSRAM, based in Munich, is a globally leading lighting manufacturer with a history dating back more than 100 years. The portfolio ranges from high-tech applications based on semiconductor technology, such as infrared or laser lighting, to smart and connected lighting solutions in buildings and cities. OSRAM had around 33,000 employees worldwide at the end of fiscal 2015 (September 30) and generated revenue of almost €5.6 billion in that fiscal year. The company is listed on the stock exchanges in Frankfurt and Munich (ISIN: DE000LED4000; WKN: LED400; trading symbol: OSR). Additional information can be found at www.osram.com.